I became a huge online shopper twelve years ago…the year that Claire was born. She arrived on Thanksgiving Day, and suddenly the weather turned brutally cold. I was in no mood for taking a newborn out and about in the cold temperatures to shop for gifts. I think I ordered most everything online that year, including gift cards. I shop online for a lot of things, and not just at Christmastime. I joke that the UPS and Fed-Ex delivery people know our address well! Seriously, I appreciate all their efforts in getting our packages to us. And if you’ve ever walked up all the steps to our front door, you would know that it requires a bit more effort to deliver a package to us! 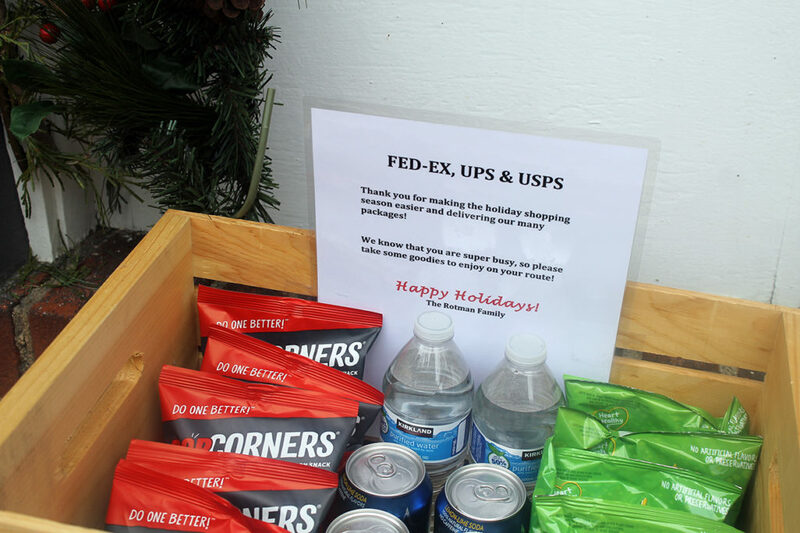 The mail carriers and parcel delivery employees definitely work overtime during the holidays. 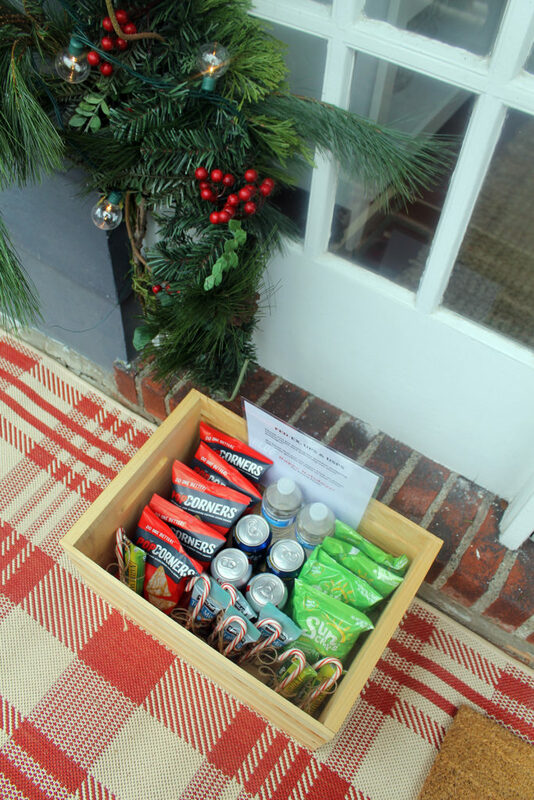 Because I appreciate all they do, I put together a container of snacks and beverages for them. I placed it just outside our front door, along with a note of gratitude. 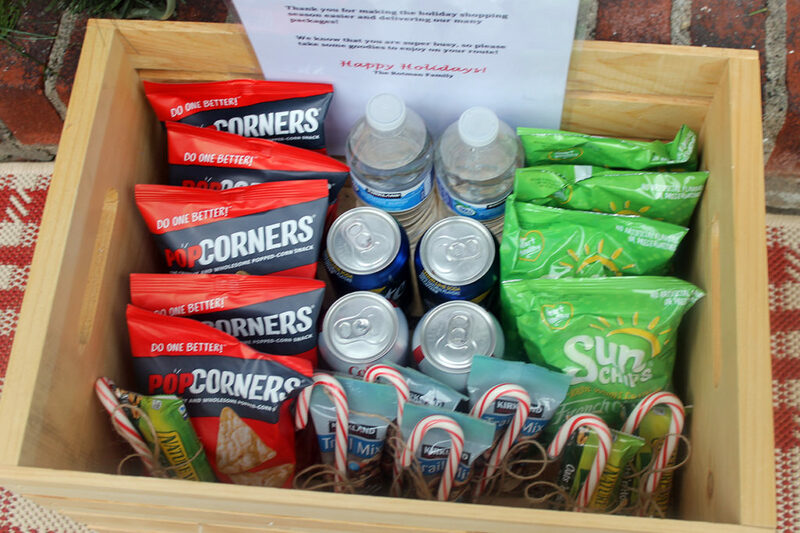 The wooden crate, which Phillip suggested I use because the plastic container I was going to use ruined the aesthetic of my holiday decor, is filled with individual bags of chips, trail mix, granola bars, water bottles and cans of soda. There is an overhang, so it is safe from the elements this time of year. Since my shopping started in mid-November, I set the snack container out a few weeks ago and I’ve already replenished it once. 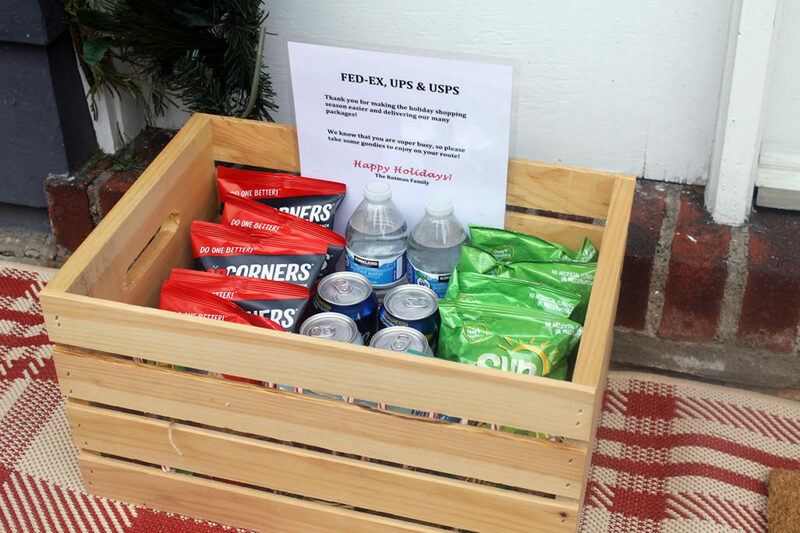 That makes me so happy to know that they are enjoying it and possibly making their route a little more fun for them as they “refuel” themselves for the rest of their deliveries. Hope you are getting some great deals on this Cyber Monday, AND that your packages arrive soon!